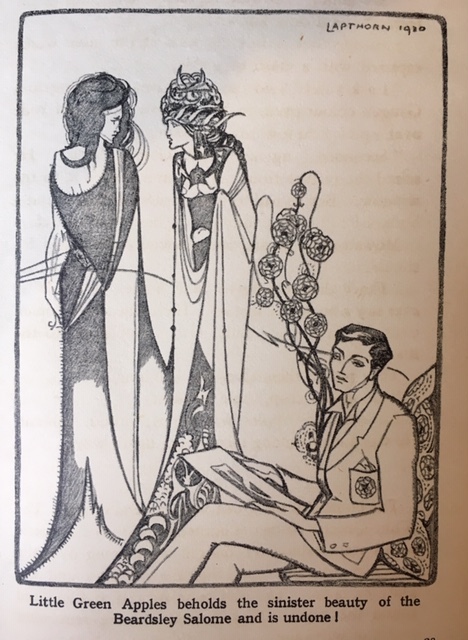 Little Green Apples: the Chronicle of a Fallen Man (1930) by Geoffrey Moss, with art deco illustrations signed ‘Lapthorn’, is the story of an undergraduate with the unlikely nickname of the title. 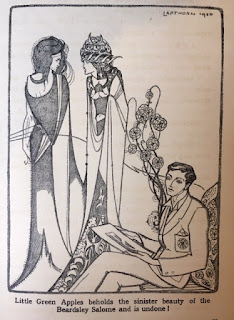 He becomes unexpectedly attracted to strange beauty when, helping a gang of hearties to ransack an aesthete’s room in college, he catches sight of an Aubrey Beardsley print and is at once captivated by it. Alas, this promising premise isn’t fully pursued. After university, a job as a golf course manager in the South of France proves illusory, part of a faintly shady set-up run by a rather louche character. Marooned and out of funds, the protagonist drifts among the margins of Riviera high life as a gigolo, but finds that this career subsequently deprives him from securing his real love. In a fairly perfunctory denouement, he and an artist friend join a travelling circus. Geoffrey Moss was the pen-name of Major Geoffrey Cecil Gilbert McNeill-Moss (11 December 1885 – 13 August 1954) of Ford Place, Ford, Sussex. Moss went to Rugby and Sandhurst and was an officer in the Grenadier Guards from 1905 until he left in 1919. He retired in order to write full time. While in the army he wrote on aspects of military training. He had some success in the interwar period with Jazz Age romances somewhat after the manner of Michael Arlen and Evelyn Waugh. His first work of fiction, Sweet Pepper, however, was set in the decaying Austria-Hungarian Empire, and his second, Defeat, a collection of stories, sympathetically portrayed post-WW1 Germany. This was filmed as Isn’t Life Wonderful? by D W Griffith in 1924. Of his other novels, Whipped Cream (1926) has been described as a “romance of an intensely modern girl struggling in the vortex of unconquerable passions and strange desires", while New Wine (1927) chronicles the somewhat hectic life of a cabaret dancer in Bucharest. His work consists of eight novels, three books of stories, a history book for children, and non-fiction works on military matters, including two accounts of episodes in the Spanish Civil War. He seems to have published nothing more during the fifteen years from 1939 to his death. Though it is not clear why, his fiction may have been out of favour in the new realism of the Forties and Fifties. Since then, his books seem to have been largely forgotten. Defeat (Constable, 1924). Reprinted as “Isn’t Life Wonderful”: Defeat & Other Stories (Constable, 1925). Notes on Elementary Field Training by ‘Grenadier’ (Sifton Praed & Co, 1915), (Hugh.Rees, 1915). Attributed to Moss. Notes on Outposts (Hugh Rees, 1915). [Extracted from the above].